The other evening I had just settled down on our little dock, glass of wine in one hand and cell phone in the other. I was enjoying a nice chat with our daughter about her recent trip to Jamaica, when the puppy started to bristle and growl at something behind me. 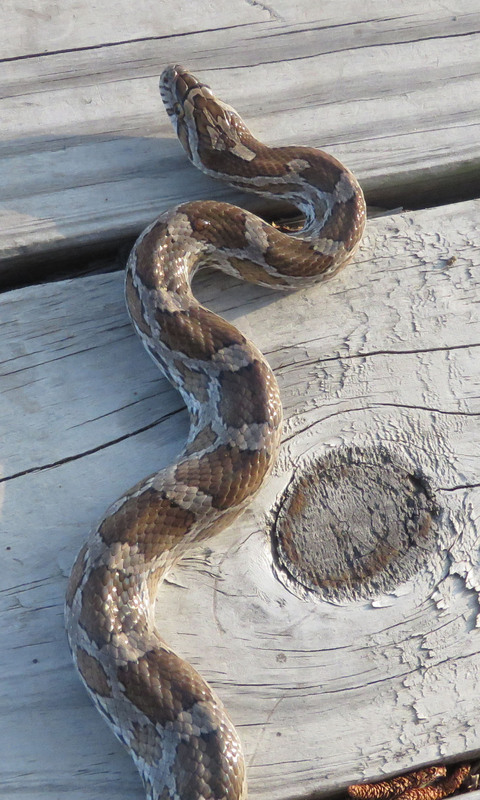 Turning around, I saw that a beautiful snake had come up through one of the holes of the dock and was surveying us. I said to my daughter, “Snake. I’ll call you back.” (I knew she’d understand, because she is even more into nature and photography than I am. You can see her adventures at My Wildhood.) I grabbed my camera and got lots of shots. Through it all, the snake seemed as interested as I was. The dogs came up to within just a few inches, but it didn’t strike or back away. The side blotches look like comic strip talk bubbles to me. Or broccoli. I really love that there is no sense of scale with snake pictures. This could be a giant python for all you know. Really, it looked to be about 18 inches long and about one inch in diameter. Getting the pictures was easy; getting the ID was another story. I remembered that the spear point marking on the head was an important characteristic, but I couldn’t remember for which species. One time here I saw a Prairie Kingsnake, and that has a spear point marking, but facing toward the spine and not the tip of the nose. 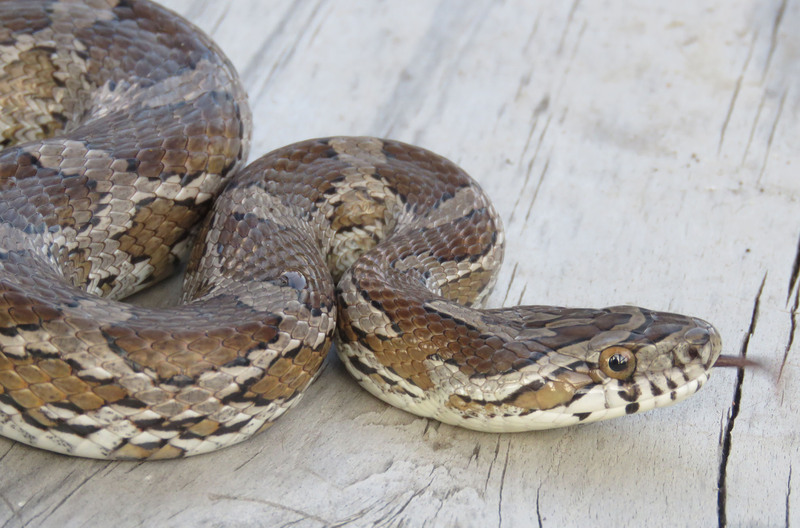 Finally I asked for ID help on Project Noah, and within a few hours someone identified it as a Corn Snake. Decades ago, I saw a Corn Snake here, basking in some shallow water. It had beautiful intense cream and red coloring, and for that reason, that species of snake is easy for me to remember. 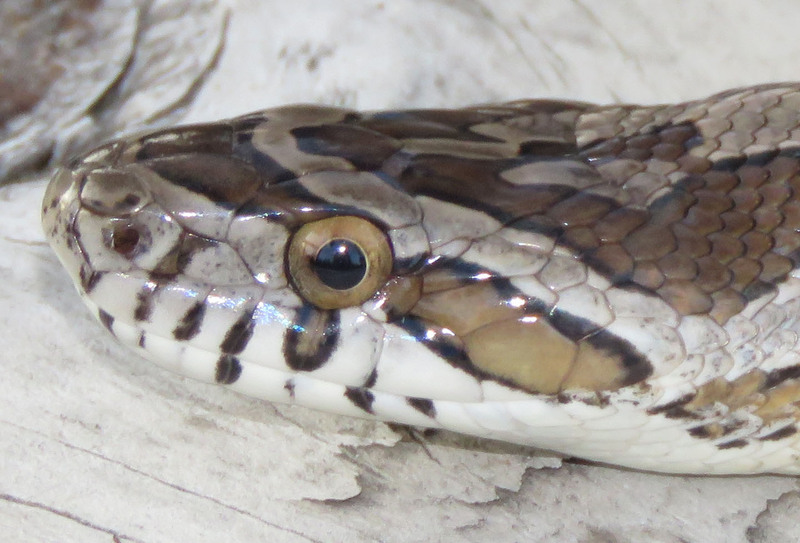 But this one was cream, gray, brown, and black — just like almost every other snake I see. This color combination is not one that helps me figure out the species. On the Wikipedia page, I learned that this combination is called anerythristic — it shows that the snake has a recessive mutation of lacking erythrin pigments, that normally cause the red, orange, and yellow colors. The really fascinating thing I learned from that page, is that because corn snakes are docile, they are popular pets, and breeders have bred them for all kinds of different color and pattern morphs, including “sun-glow,” “caramel,” and “fluorescent orange.” I would love to see them! Wow, that was fun! I missed seeing your post the other day, with company in the house. Glad I had a chance to catch up. Well, I actually was trying to schedule it for the future, and ended up hitting a time that was in the past, and it said “posted 15 hours ago” or something like that. But glad you liked it! I like the immediate and joyful style of her writing. There are so many ‘voices’ in these blogs. It is part of why I like blogs … Definitely a different way of communicating ideas and experiences. You are so right as at first I thought that fellow was about 3″ in diameter! Pretty snake and so glad he wasn’t poisonous..